Nearly any job on an Elgin, IL construction site is inherently dangerous and can quickly lead to a life-threatening accident with severe injuries. In many incidences, construction workers are injured by the negligent actions of project developers, subcontractors, general contractors, property owners, coworkers, building material manufacturers, suppliers, and distributors. If injured, the worker has the legal right to seek financial compensation to recover their damages. If families lose a loved one in a job-related accident, they have the right to seek financial compensation to pay for funeral expenses, burial costs, grieving, mental anguish and the loss of the decedent’s future earnings. However, these cases are complex. Hiring the skills of a dedicated Elgin construction site accident lawyer specializing in premises liability, construction accidents, and wrongful death can simplify the process and ensure that the family receives adequate compensation quickly. 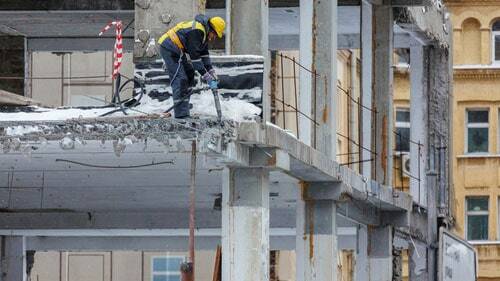 Rosenfeld Injury Lawyers handles construction site accident cases across Illinois. If you or a family member was injured on a construction project in or around Elgin, contact our attorneys for a free case review. South Elgin Neighborhood Resurfacing Improvement Program – Now that the warmer season in 2018h as arrive, road construction is about to begin in the Village of South Elgin at numerous locations including on Thornwood Way, Cole Dr., Carter Court, Reserve Court, Thornwood Ave., Sutton Drive, and Ellington Court. Many of these projects will offer detour routes were drivers will otherwise experience intermittent traffic and road closures. Dundee Area Construction Projects – The Villages of Carpentersville and W. Dundee have begun numerous road widening street improvement projects to upgrade Huntley Road. The construction project will transform the two-lane roadway into a five Lane Street that runs from Elm Avenue to Sleepy Hollow Road. Drivers will experience significant traffic delays during the project with reduced travel times. The project is finally ago after significant delays in acquiring right-of-way parcels. City planners expect the project to last 18 months. Chicago Spire – Initial plans are underway for a new two soaring towers Chicago Spire project to be built along Lake Shore Drive. The 800-foot tower project will include 550 rental apartments, 175 hotel rooms, and 300 condominium units. The project will be built on the location of the city’s infamous hole in the Streatorville neighborhood where Lake Michigan meets the Chicago River that was created just before the worldwide financial crisis in 2007. Designers have decided on a terra-cotta exterior detail articulated with glass. Maintaining an occupation in the construction industry can be risky. The uniqueness of every construction project brings with it serious challenges and risks associated with planning, building and finishing the job. When any risk results in an accident, the inherent dangers disrupt the project and instantly identify a failure to assess, monitor or control the potential problems. Most accidents with injuries and fatalities on a construction site are the result of negligence or unidentified safety hazards. Elgin, Illinois – In October 2017, first responders extricated two construction workers from a deep trench after one worker fell from a ladder, landing on his co-worker. The contracted employees were digging huge trenches to install natural gas pipeline along McCormick Road close to big timber Road. Both workers were found 20 feet down in the trench suffering injuries. Firefighters lowered rescue personnel to the man to assist in their injuries before pulling the men out manually using pulleys and ropes. The entire rescue mission took approximately 40 minutes. Both workers were transported to the local hospital by helicopter and ambulance. Des Plaines, Illinois – In April 2016, a deadly job-related accident claimed the life of one worker and injured three others at a Des Plaines road widening construction site. The incident occurred just after 3:00 AM under Interstate 90 on Tooley Avenue when a massive heavy beam slipped from a crane and fell on workers below. OSHA (Occupational Safety and Health Administration) investigated the accident and issued a fine against the workers’ employer Omega Demolition citing safety violations. Elgin, Illinois – In December 2014, first responders arrived at the scene where a construction engineer was suffering severe injuries at an Elgin, Illinois bridge construction site over Fox River. During the incident, building materials fell from a crane crushing the engineer who suffered a broken nose, ribs, knee, and back. Rescuers transported the contracted Naperville engineer to the Advocate Lutheran General Hospital Intensive Care Unit in Park Ridge. The injured victim underwent multiple surgeries and surgeons are not optimistic that the engineer will ever walk without assistance again. Kane County, Illinois – An autopsy report by the Kane County coroner revealed that a contracted construction employee working in the tower at the Geneva Commons shopping center died of asphyxiation due to compression after being pinned between the tower and a crane. The coroner determined that the victim’s airway was pinched to the point where it caused the accidental death. The victim had been working inside the tower before becoming entrapped. OSHA and the King County coroner’s office opened investigations into the matter. Property owners, project developers, supervisors, managers, and foremen must understand the technical risks, logical problems, and environmental hazards when managing a construction site. Every worker’s life can be spared with foresight, adequate training, and ongoing education required to follow effective safety protocols. When accidents do occur, injured victims and family members of a deceased construction worker killed on the job have the legal right to seek financial compensation to recover their monetary damages. Did you lose a loved one or have you suffered serious injuries in a job-related construction site accident or incident in Elgin, Illinois ? If so, you and your family are likely entitled to file a claim or lawsuit to obtain financial compensation to recover your losses, injuries, and damages. Any victim injured at work can file a worker’s compensation form to obtain monetary benefits to cover their medical expenses and time off of work while they heal. Surviving family members of a loved one lost in the construction site accident have the legal right to file a wrongful death lawsuit against any individual, company or entity that caused their death. Filing the paperwork and handling every aspect of a compensation claim or lawsuit is extremely complicated. Without an attorney, many lawsuits take years to resolve. Hiring a lawyer who specializes in Elgin construction site accidents, wrongful death lawsuits and premises liability cases can ensure you and your family will be adequately compensated for all of your damages. These damages will likely include the loss of capacity to earn a living in the future, permanent or temporary disability, funeral expenses, burial costs, mental anguish, pain, suffering and other intangible losses. Contact Rosenfeld Injury Lawyers (888-424-5757) now to schedule an initial, free case consultation. Let our team of attorneys review your case and discuss your legal options. Our dedicated law firm has won a negotiated millions of dollars in compensation on behalf of our clients and can do the same for you and your family. We offer every client a “No Win/No Fee" Guarantee, which means you pay us only after we have negotiated your out-of-court settlement or have won your jury trial award. If we are unsuccessful, you owe us nothing. Contact us today and let us begin working on your case for compensation now.